The Mouse and the Motorcycle is a book about a mouse named Ralph who longs for adventure, but doesn't have much of a chance until a little boy with a toy motorcycle moves into the hotel where Ralph and his family live. The little mouse cannot resist the toy motorcycle, and embarks on an adventure that abruptly lands him in the trash. Fortunately for Ralph, the little boy discovers Ralph, and is keen on helping the mouse overcome all the obstacles his new found freedom puts him in. This book is a great independent read for adventurous 3rd or 4th graders. 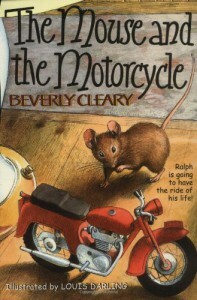 Beverly Clearly is a fantastic author who struggled as a child with reading, but went on to write many successful books as an adult, including The Mouse and the Motorcycle. You could do an entire themed study on Beverly Cleary, making several of her books available to the class, and introducing them through a "book tasting", a method of introducing books to children in a fun way that gets them interested in reading. After reading their books, the students could choose from a variety of ways to present a "book report" to the class.